Mopar Replacement Igntion Coil 93-97 Mopar 3.9L, 5.2L, 5.9L Mopar Replacement Ignition Coil 93-97 Mopar 3.9L, Mopar Ignition Coil 93-97 Mopar 4.0L, Mopar Replacement Ignition Coil 93-97 Mopar 5.2L, Mopar Replacement Ignition Coil 98-02 Mopar 5.9L, 93-97 Dodge Dakota Ignition Coil, 93-97 Dodge Ram Ignition Coil, [Mopar 4797293AB Ignition Coil] - $59.95 : 3rd Strike Performance, Your Source for Late Model MOPAR Performance Parts and Accessories! Mopar Replacement ignition coils are genuine parts you can count on to supply the OE-fit and function you're expecting. 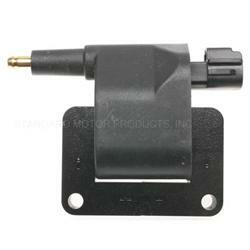 Manufactured from quality materials, Mopar ignition coils will provide the necessary voltage to fire your spark plugs.